Hindu God Brahma is one of the Trimurtis – Brahma, Vishnu, Mahesh (Shiva) – in Hindu tradition. He discharges the function of creation and therefore is known as the creator. Brahma was the first to appear from the Supreme Truth. Symbolically this is represented by Him appearing from the navel of Vishnu. Brahma appeared from a lotus stem emerging from the navel of Vishnu. He was then assigned the task of creation. Brahma had self doubt. He found himself not capable to this gigantic task. The Supreme Truth instilled confidence in Brahma by asking Him to practice austerities. He then achieved the confidence and skill for creation. 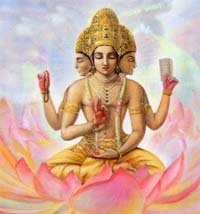 Brahma has four faces and is seated on a lotus with the Vedas and a rosary in His hands. His vehicle is the Swan. The most popular Brahma Temple is located at Pushkar in Rajasthan. Why there are Very Few Brahma Temples?